Have you ever been in a rush to put together a delicious meal? Well, I certainly have. And there have been many (perhaps too many) nights where I’m craving a delicious, yet healthy fish dish but I don’t have the energy to marinate overnight or be fancy about things. This is by far, my favorite and quickest Asian-style fish recipe that makes my taste buds tickle with happiness. 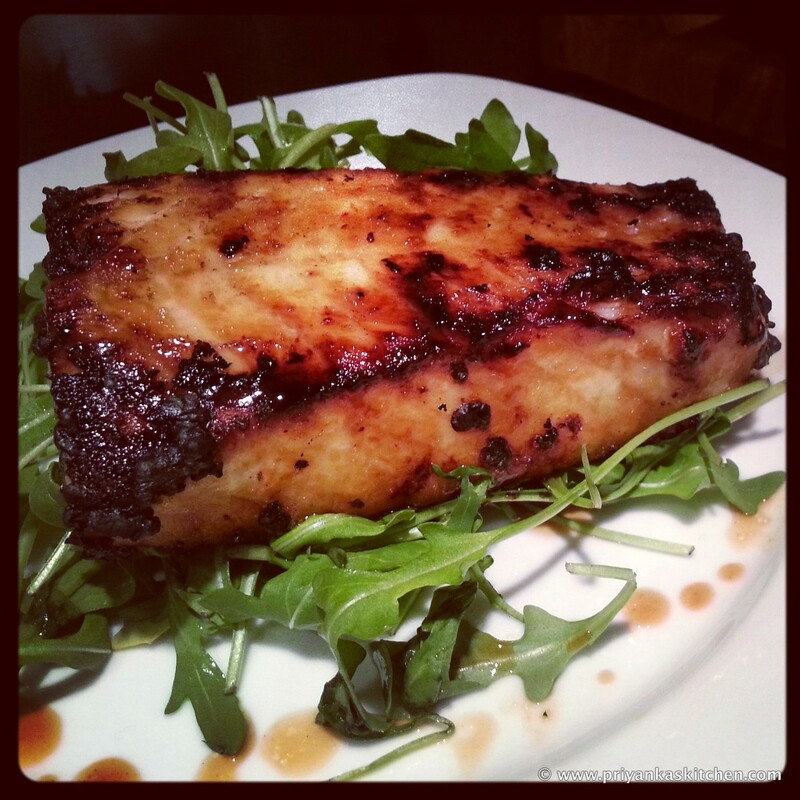 The beautiful color of the fish and the charred bits from the grill are the most beautiful part of this dish. The simplicity of the flavor (and low calorie count) make this recipe a true winner! Combine the first four ingredients in a bowl and marinate your fish filet while you heat up your grill (up to 20 minutes, but less is fine!). Once your grill (or oven) is hot, cook the filet for about 5-8 minutes, flipping and basting occasionally until the fish is flaky and cooked to your liking. A dear, foodie friend of mine has so kindly loaned me his sous vide machine (these things are pricey!) – and boy have I been having fun with it! Just when I thought that sous vide experiences were reserved for my daydreams while I watched Iron Chef episodes, I’ve been graced with the opportunity to experiment with this glorious mechanism and absolutely divine way of cooking foods slowly and gently at various temperatures. 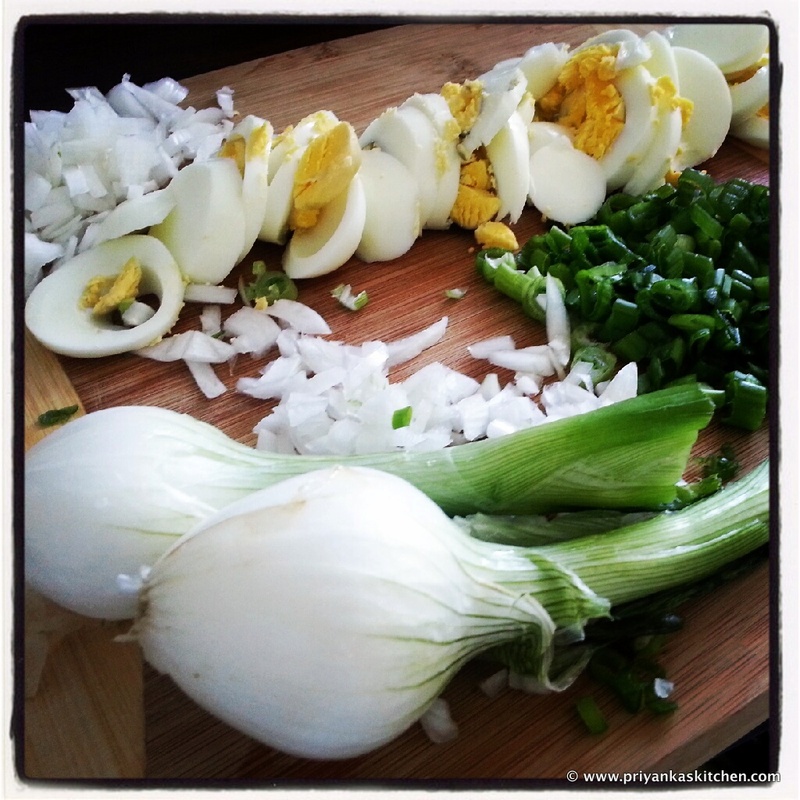 Given that I’m a true egg fanatic, I had to start my experiments with eggs. I wish I owned one of these machines now – I think it will be hard to go back to stove-cooked eggs! I hope you enjoy this simple recipe – it does require a sous vide machine, but don’t worry if you don’t have a sous vide machine – just poach your eggs in boiling water on the stove per your liking, and the rest of the recipe can stay the same! If any of you had childhoods like mine, I grew up eating boiled white rice with soy sauce and butter – and this recipe takes me down memory lane in such a warm, fuzzy way :). Preheat your water ‘oven’ using your sous vide machine to 145°F. Place eggs (in shell) in water bath and cook for at least 90 minutes, and up to 4 hours (depending on how runny you like your eggs). Divide hot rice evenly amongst four serving bowls. Carefully crack your cooked egg, creating a hole at one tip using your fingertips to allow the contents to come out. 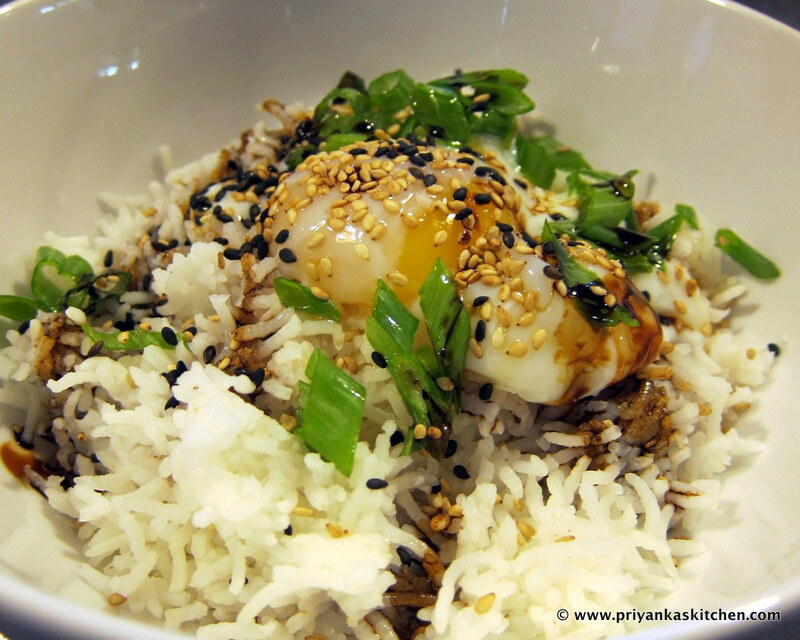 Pour out the egg into a small bowl, then carefully pour it, or ‘set it’ on top of rice. 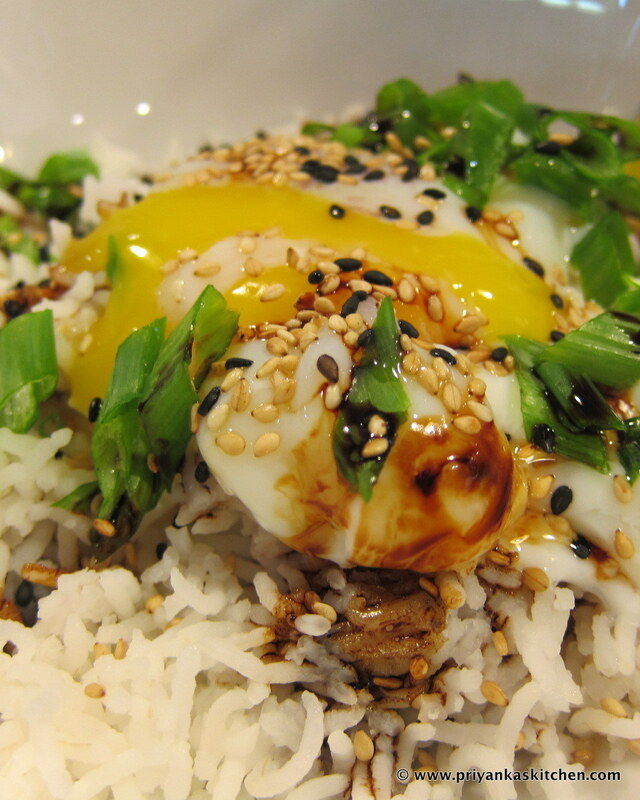 Drizzle with soy sauce, sprinkle with sesame seeds, scatter sliced green onion on top, and eat, mixing egg into rice! Garnish with Kosher salt, to taste, if needed. For those of you who enjoy Thai food, you must have ordered Pad Kee Mao or Pad See Eew (a.k.a. ‘Drunken Noodles’) at some point. Hopefully you enjoyed them as much as my husband and I do! Pad Kee Mao literally translates to ‘Drunken Stir Fry’ in English, and there are numerous variations on these ‘drunken’ dishes that are very often sold by street vendors in Bangkok and the rest of Thailand. Pad Kee Mao typically has sliced pork in it, however this is my rendition of it with ground chicken and vegetables! However, feel free to omit the chicken and replace with 1/2 cup of thinly sliced pork (of any cut), or use both meats and have a flavor party! I wanted to re-create what I had at the Thai restaurant (but without the MSG and loads of oil that made my noodles super shiny), so I hope you enjoy my healthier version of Pad Kee Mao. 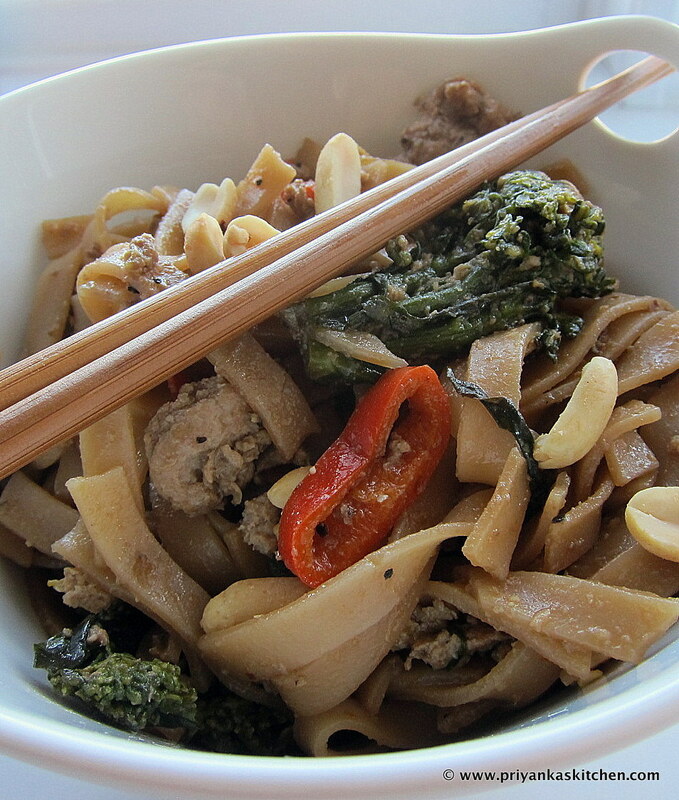 Menu Idea: Chiang Mai Panang Curry, Pad Kee Mao Noodles, Miso Black Cod, steamed white/brown rice. Place noodles in a large bowl and cover with boiling water. Soak for about 15-20 minutes until loose and almost completely to your liking. Drain and set aside. Add ground chicken and break into small pieces. 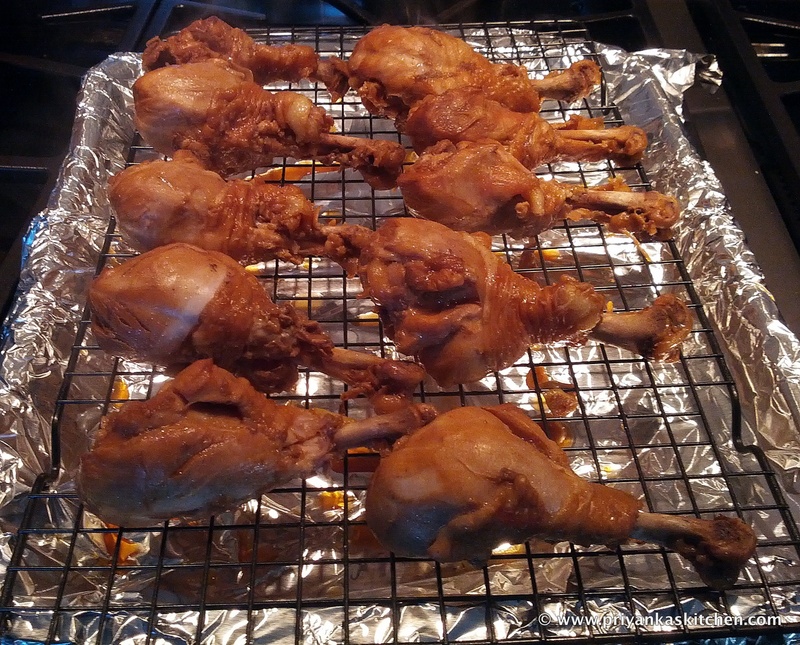 Continue to cook until chicken is white and almost cooked through, about 3-4 minutes. Add bell peppers and broccoli florets, stir-frying until the vegetables are softened. Push chicken mixture to one side of the pan and add eggs to the center. Scramble with a your wooden spoon until eggs are set and don’t run, about 1 minute. Push scrambled eggs to the side and add in: oyster sauce, fish sauce, soy sauce, lime juice, and sugar. [Note: If you feel like there is not enough liquid in the pan and the noodles are too dry, feel free to add a little chicken broth]. Living in the Bay Area allows me to indulge in a large lot of Asian dining options – the diversity here is immense and incredible. Part of that, however, leads to people like me to be utterly confused about the true origin of certain dishes. For example, one of my all-time favorite Asian eateries is called ‘Mingalaba‘ in downtown Burlingame, California. I find every and any excuse to drag my friends and family there for a meal :). However, go figure, they are a ‘Burmese-Mandarin’ restaurant. Now shoot, last time I checked, those are two very different cuisines with incredibly different ingredients and spices. My favorite two dishes there are their ‘Tea Leaf Salad’ – it’s incredible and one of these days I will try and recreate it. Once I perfect it, I PROMISE to post the recipe. 🙂 The other is their ‘Ong Noh Kaw Soi’, or their Coconut Chicken Soup. This Panang Meat Curry recipe, my friends, is my attempt, to recreate what they have at Mingalaba. For those of you that are of Thai background, you might wonder why I ate this typical Thai curry at a Burmese and Mandarin style restaurant. To be honest, I can’t answer your question and am at a complete loss. The further research I do on this curry , the more I am lead to a Thai and Malay heritage for the dish. Perhaps over the ages, cultures merged from a culinary perspective, or there were a lot of similarities – I don’t know. 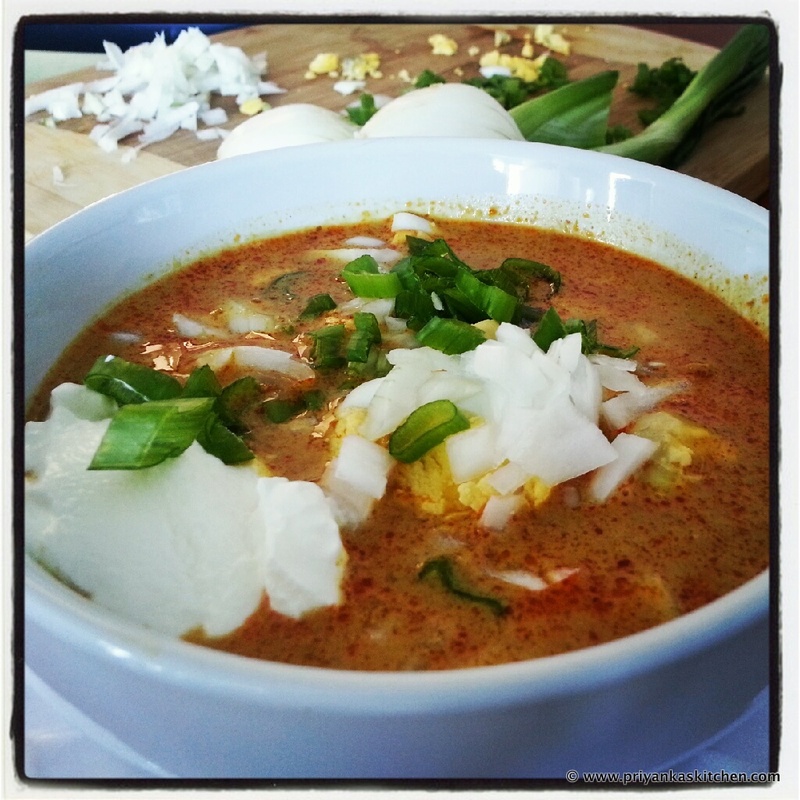 But either way, here is my rendition of one of my favorite curry soups of all time – it’s creamy, spicy, crunchy (with the right garnishes), and extremely satisfying. It is traditionally served over fresh hot noodles, however this is a low-carb version without (but feel free to serve this soup over freshly cooked noodles (spaghetti, linguine, chinese noodles, or any other long, slender noodle that you fancy or have in your pantry). Also, you can make this curry vegetarian if you wish by using firm tofu instead of the meat, and vegetable broth instead of chicken broth. And lastly, if you are in a rush (like I often am), don’t fret! 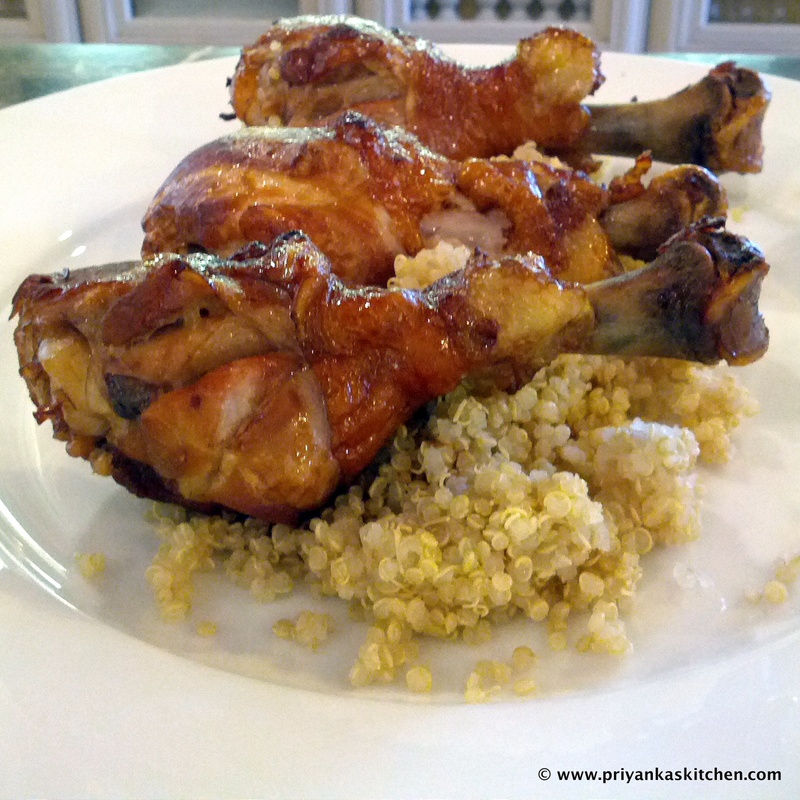 Pick up a fresh rotisserie chicken from the market and add the cooked chicken at the very end! This will cut your cooking time down from 30 minutes to about 8-10 minutes TOTAL! It’s an incredible ONE-POT weeknight meal, yet fancy enough to serve to guests. Heat the vegetable oil in a medium saucepan over medium heat. Add garlic and panang curry paste at the same time, mashing and stirring it constantly to soften it in the oil (I prefer using a wooden stick in order to avoid damaging my pan). Do this for about 1 minute. [Note: Use a splatter screen or be VERY careful! The hot oil and ingredients can jump up out of the pan and stain your clothes or worse, burn you!]. Add the chicken (or beef or tofu) and brown for 1 to 2 minutes, tossing using tongs. Allow them to brown evenly and incorporate well into curry paste and garlic mix. 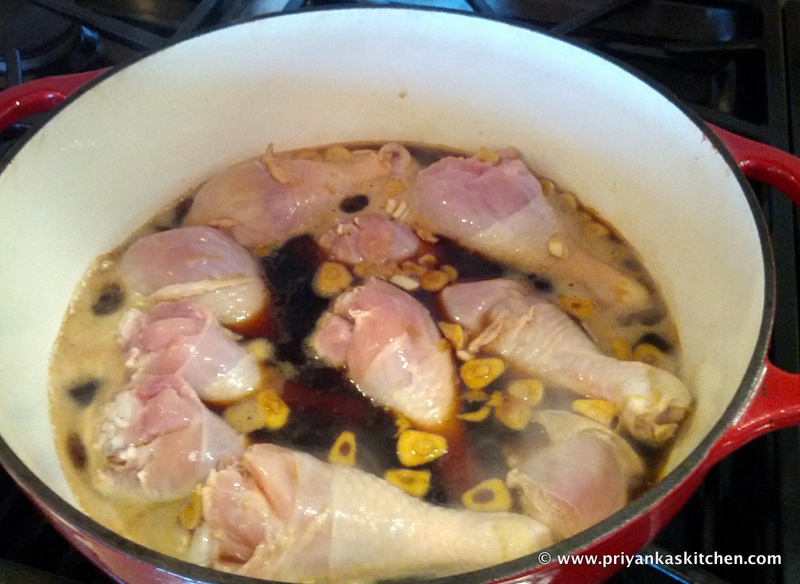 Add the coconut milk, chicken (or vegetable) broth, turmeric (or curry powder), soy sauce, sugar and salt, stirring well. Bring to a gentle boil and adjust heat, maintaining a simmer. Cook about 10-15 minutes until meat is cooked through. 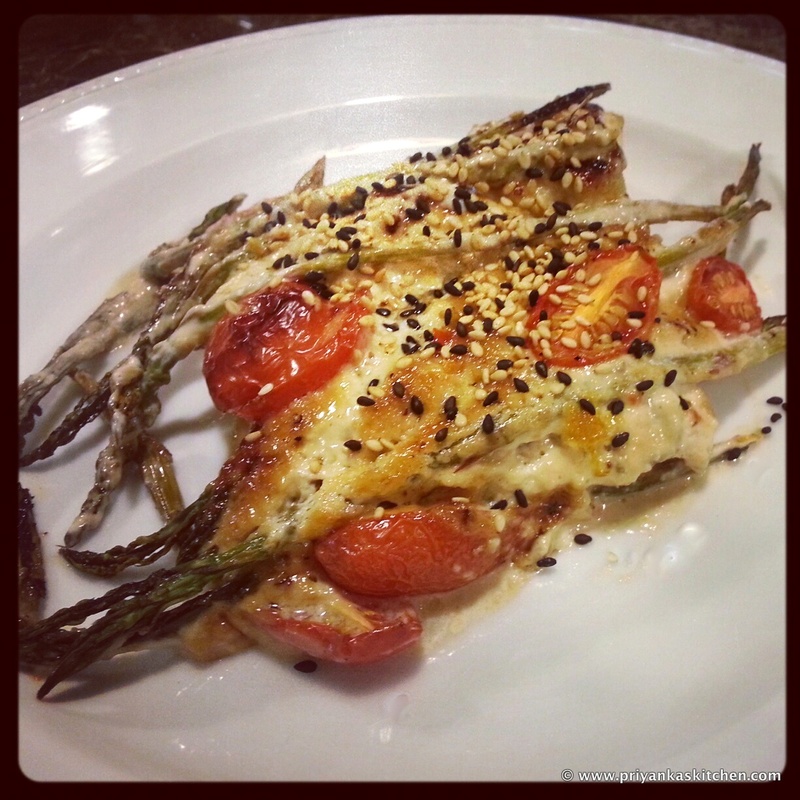 The thing I love about this recipe is that it is healthy! Traditionally, Chicken Adobo involves browning the chicken in hot oil before simmering it in the vinegar marinade to finish the cooking. 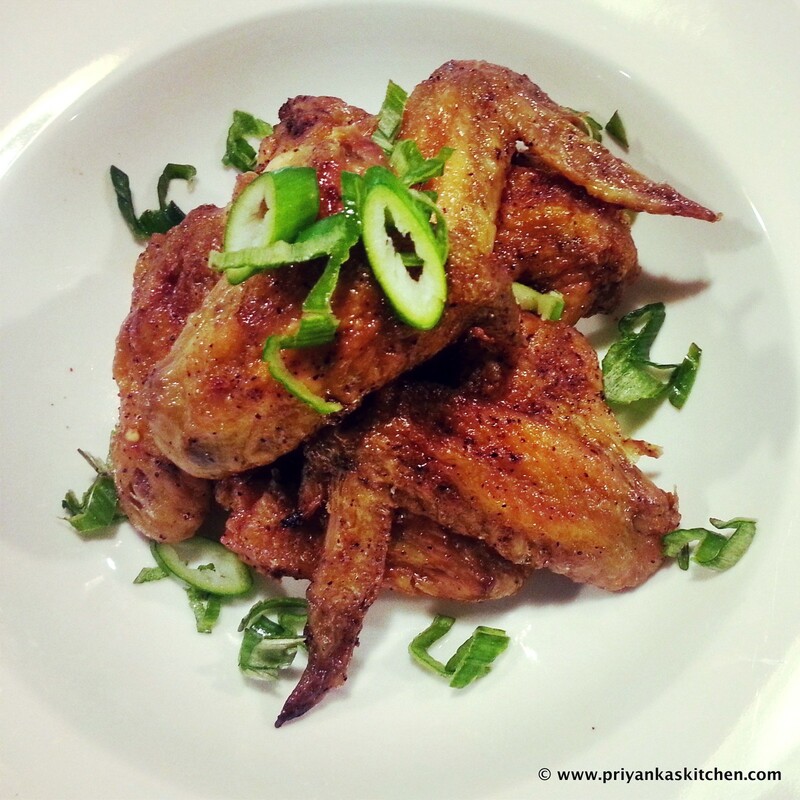 However, this is a no-fry recipe and just as delicious! 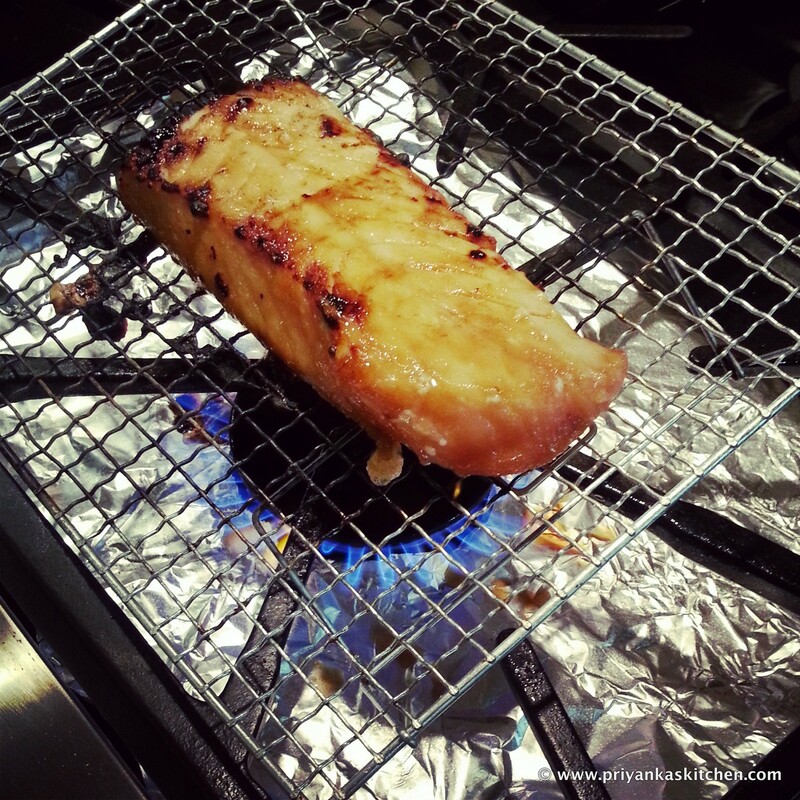 You get the same crispiness from the broiling in the oven that you would from pan-frying it! I did change a few things in the recipe a bit by adding some sweetness to the sauce through pineapple juice (but you can use brown sugar or even honey if you’d like), increasing the garlic amount (I love my garlic! ), and adding peppercorns and bay leaves to the cooking liquid. However the original recipe is also just as delicious and involves less ingredients if you are looking for a more simple recipe. Combine all ingredients except chicken in a large pot and bring to boil. Add chicken pieces in a single layer and lower heat. Cover and simmer for 30 minutes, turning chicken over once halfway through. Heat oven to the ‘broil’ setting (or 550 degrees F). Remove the chicken pieces from the pot and turn up the heat on the reserved cooking juice until it reduces and thickens a little more. (Discard bay leaves at this point if you want). Broil each side of the chicken for 3-4 minutes until browned to your liking. When the chicken is in the oven, be sure to watch it carefully so it does not burn! The ‘broil’ setting can get very hot! Serve hot out of the oven by brushing the reserved (and reduced) cooking liquid over each piece of chicken liberally (I personally love eating this dish with a little bowl of the reserved cooking liquid and dip my chicken in it for every bite!). Finish your preparation by sprinkling Kosher salt over the chicken, also liberally and to your taste. Best served on top of a bed of rice or quinoa (as pictured!) and make it a meal by adding a side of steamed or pan-cooked vegetables!